The last several days have been deeply unsettling, to say the least, and as many people have pointed out, Paris, and the rest of us, must try to move forward and carry on, despite the grief and anger in our hearts. We need to remember there will always be light, and love, and moments of joy, despite efforts of some people to extinguish them. And there will always be beauty in the world, and I will continue to celebrate things I find beautiful as long as they exist. And with that in mind, I'm continuing with my New York stories, because they make me happy, and hopefully you find them entertaining. 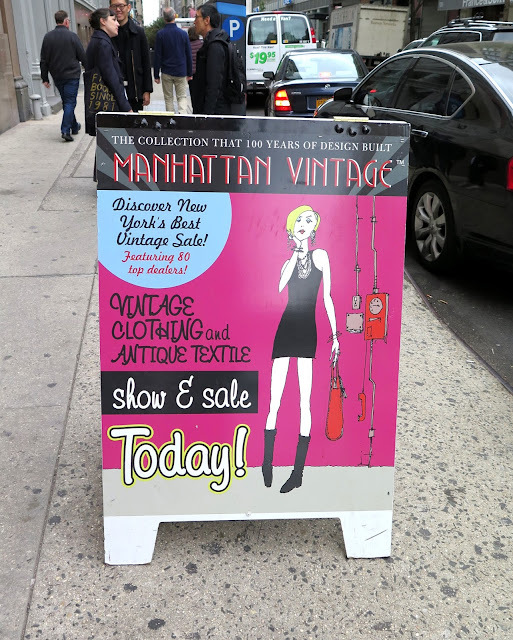 I time my visits to New York to coincide with the fall Manhattan Vintage Show. This was my fifth year attending the show, and each year I find new things and people to admire. Each show (it is held three times a year) features a display dedicated to a particular designer or theme in the lobby of the venue. 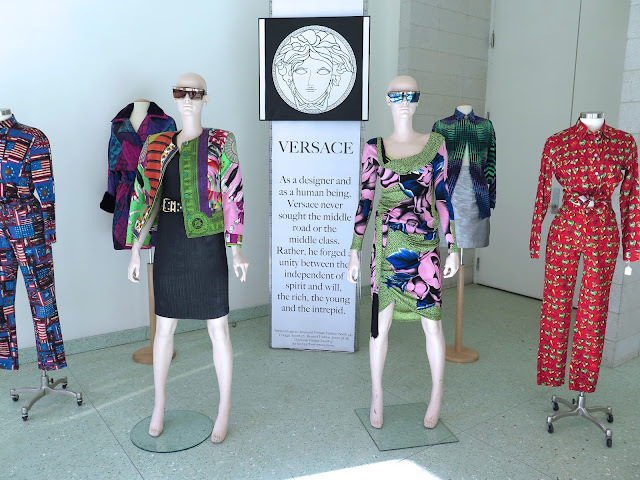 This time the display featured the designs of Gianni Versace, and vendors contributed colourful vintage Versace items from their stock. I've never been a big fan of Versace's designs, but I can appreciate the bold colour mixing. The photos above shows the range of styles you can find at the show. 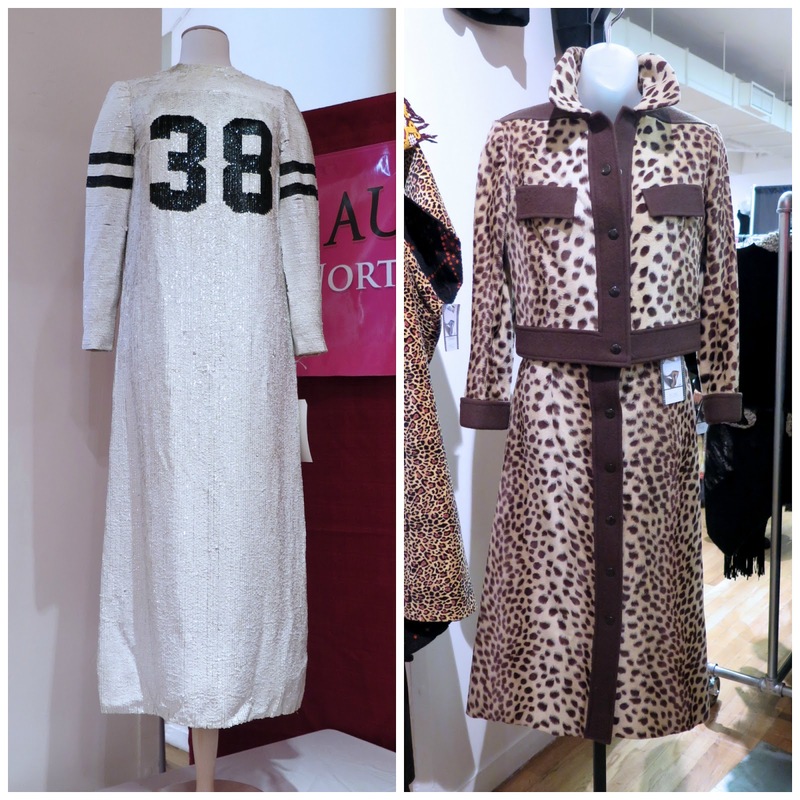 The rare sequinned Geoffrey Beene Football jersey dress from 1967 was on display at the Augusta Auctions booth, and the animal print suit was at Amarcord Vintage. 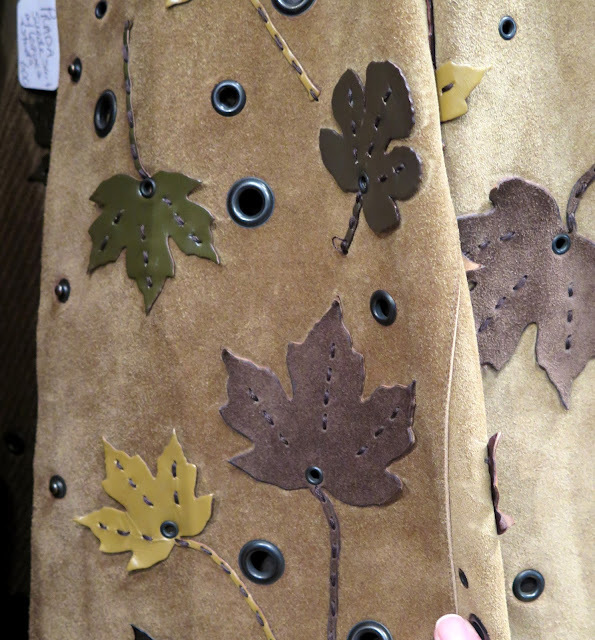 One of the good things about the fall show is that you get to see a lot of amazing coats (and if you've followed me for a while, you know I have a thing for coats). 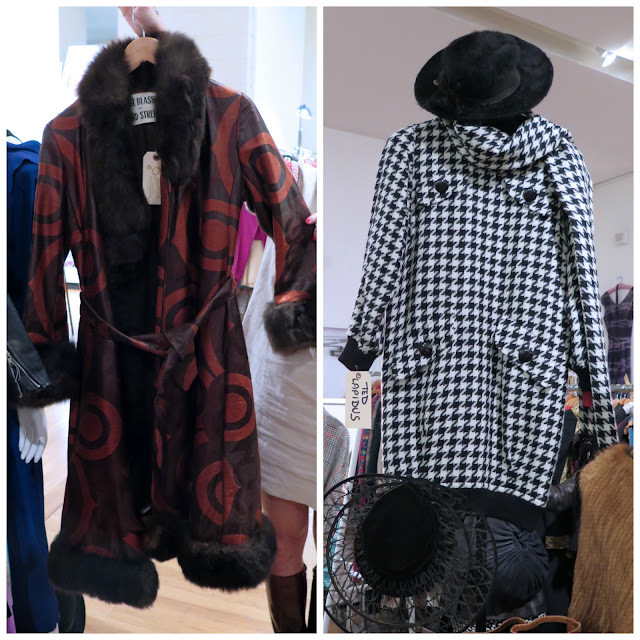 The gorgeous Bill Blass fur-trimmed coat on the left is from Olive's Very Vintage. Jen, the lovely owner of Olive's (who is kindly holding the coat up for a photo), is one of the nicest vendors at the show and I enjoy stopping by her booth for a chat. 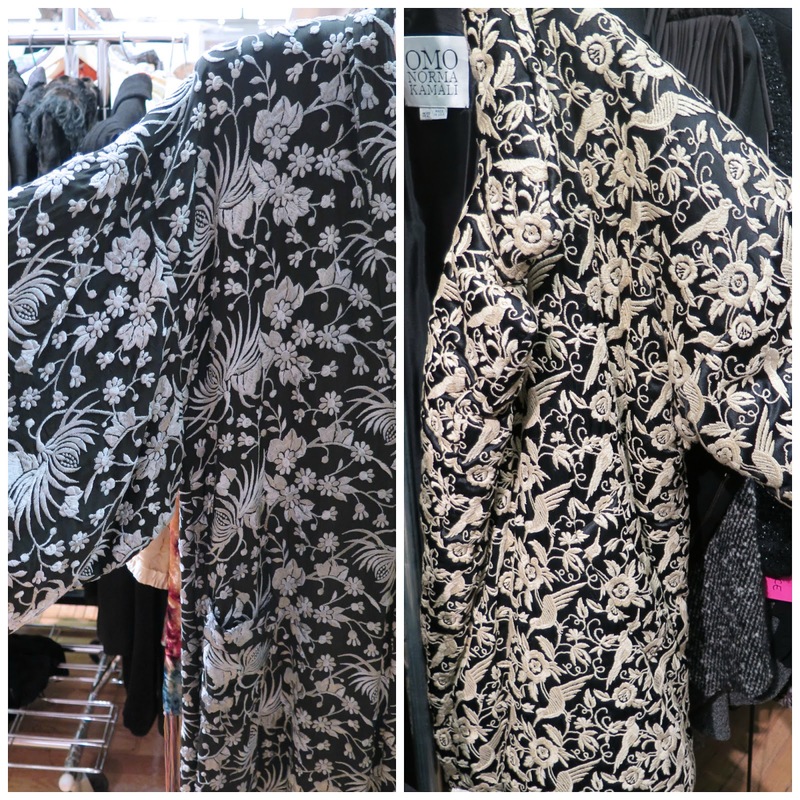 The houndstooth print on the right is from Metropolis Vintage. I was crushing on this duck-embroidered coat at Vintage Martini, even though no one else seemed to share my enthusiasm (come on, yellow and white ducks, on a coat!). 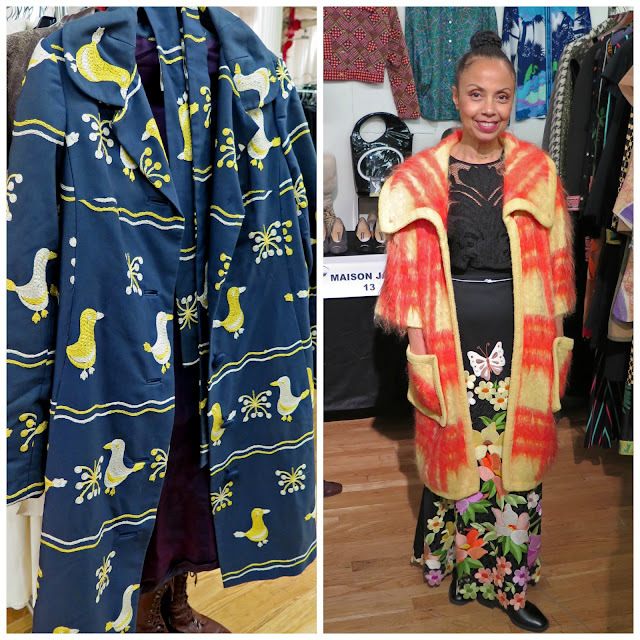 We did reach consensus that the mohair coat on the right, modeled by Mary Ann, owner of Maison Jadis was a fabulous statement piece. You are guaranteed to see items at the show that will cause you to wonder who wore them, and wherever did they get them. In the "this is so weird it's kind of cool" category was this dyed persian lamb cape, complete with leather fringe at Lofty Vintage. Green seemed to be a big colour this year, with a number of vendors featuring items in various shades on display. The young woman on the left was working at the Maison Jadis booth and was rocking the vibrant maxi she wore on Friday. 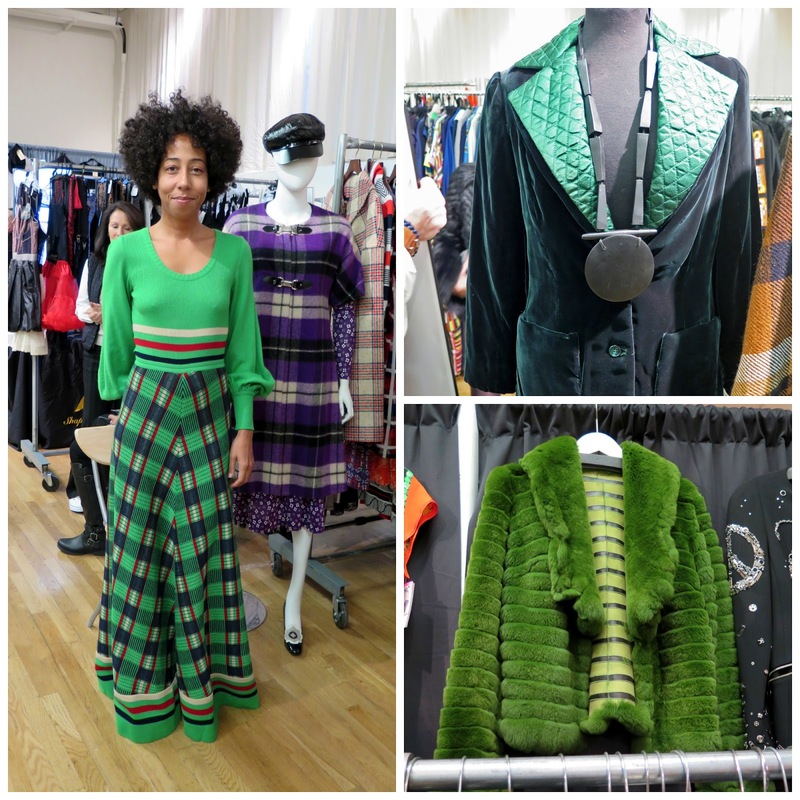 The velvet and quilted jacket on the top right is from Vintage Martini (I loved the necklace) and the acid green fur was part of a display at Lofty Vintage. 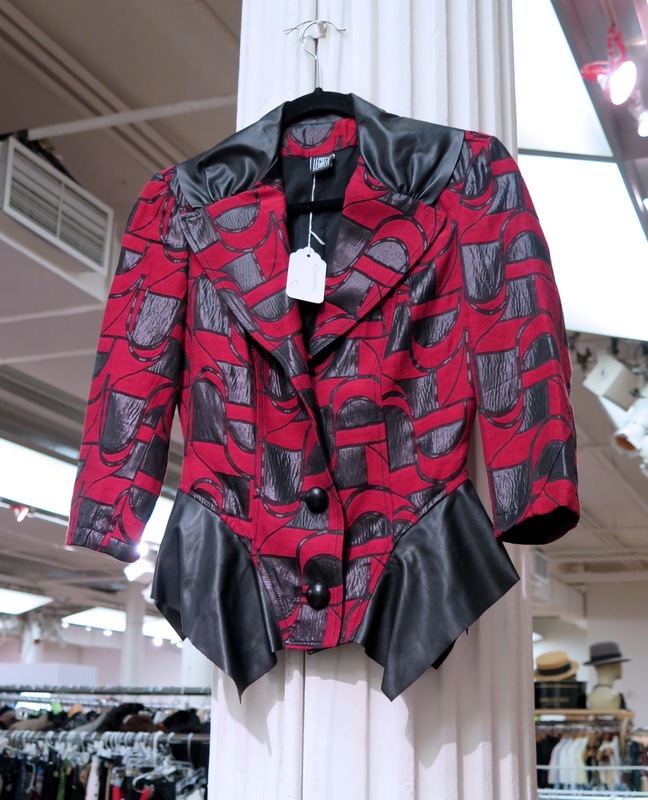 This little jacket caught my eye at Leon's Vintage. The pattern, three-quarter sleeves, and the leather peplum made it something I could have happily incorporated into my wardrobe. However, as my closet seems to be bursting with jackets at the moment, I didn't even ask to try it on. I was surprised, and rather proud, of my restraint. One of the things I love about shows like these is that you get an opportunity to see the creme de la creme of vintage, including some spectacular novelty pieces like this sweater at Olive's Very Vintage. This is the back view of the sweater - the grey-jacketed arms wrap around from the front. 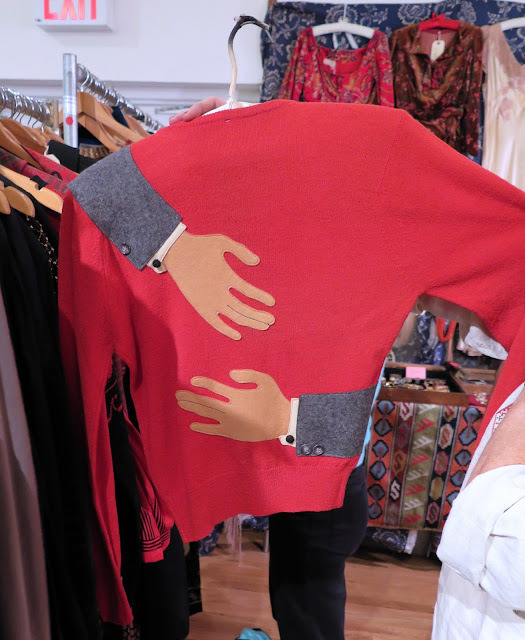 This would be the ideal thing to wear on those days when you really need a hug. Many of the pieces in the show feature ornate hand-done embellishment, such as on this embroidered blouse from the early 1900's, shown off by Heather Ramey, owner of Noble Savage Vintage, which carries a good selection of clothing and accessories from the first half of the 20th century. I didn't plan for these photos to fit together like this, it was a lucky accident. The embroidered navy robe on the left is from SwaneeGRACE and I believe was from the 30's or 40's. The Norma Kamali coat on the right also features nature-themed all-over embroidery. The coat, from Lofty Vintage, would keep the wearer extremely warm, and also make them look like a very fancy Michelin Man. 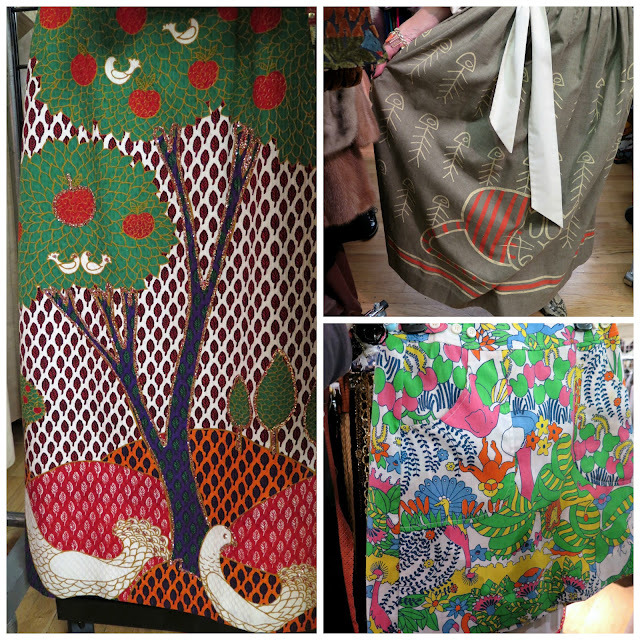 The prints on these three skirts were some of my favourites from the weekend. The "birds and trees" print maxi was at Maison Jadis, the "Cat and fish skeleton" was from The House of Findings, and the candy-coloured jungle-print cotton mini was from E-Collectique. 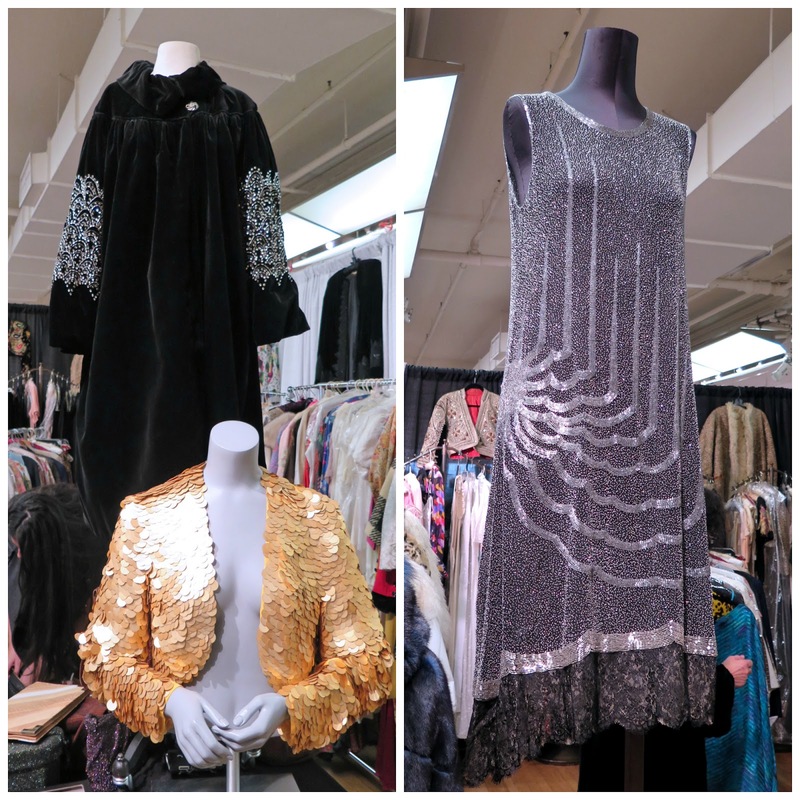 Lisa D'Angelo always has spectacularly embellished pieces from the 20's and 30's on display in front of her booth, Lisa Victoria Vintage. This year, I sighed over the beautiful Art Deco velvet cape/coat on the left and the made-in-Belgium beaded dress from the 20's on the right. I would love to be able to wear something so dazzling just for one night (and not worry about damaging it). 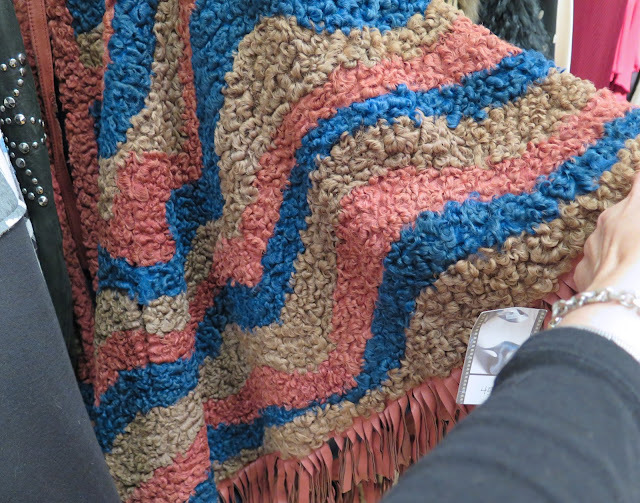 There were some vendors at this year's show that I did not remember seeing before, including Vintage! which featured some amazing eye-candy from the late 20th century. 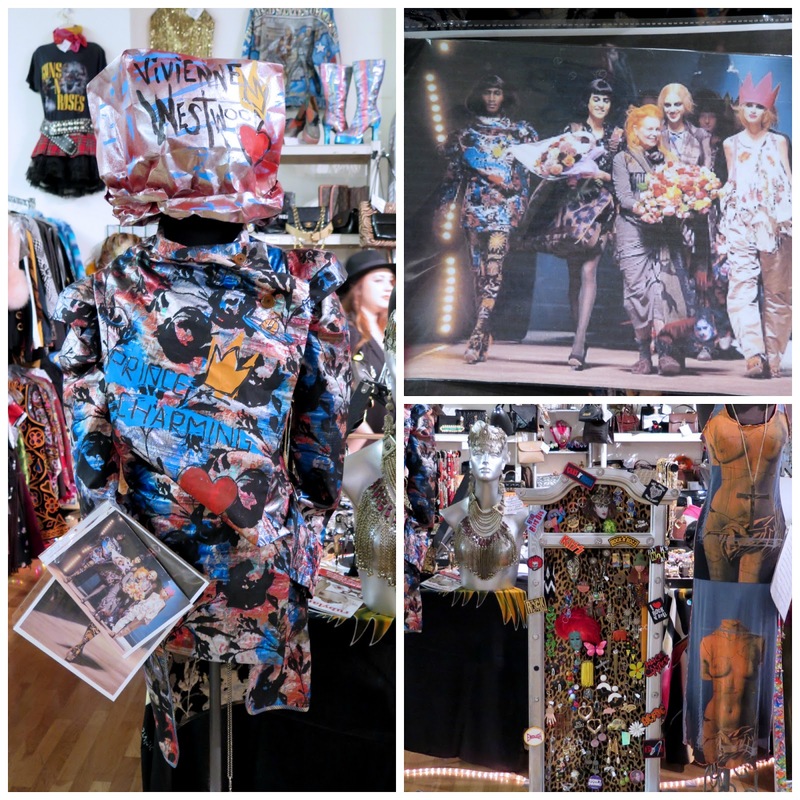 The Vivienne Westwood "Prince Charming" outfit on the left was featured in one of her runway shows, and had the accompanying photo to prove it. 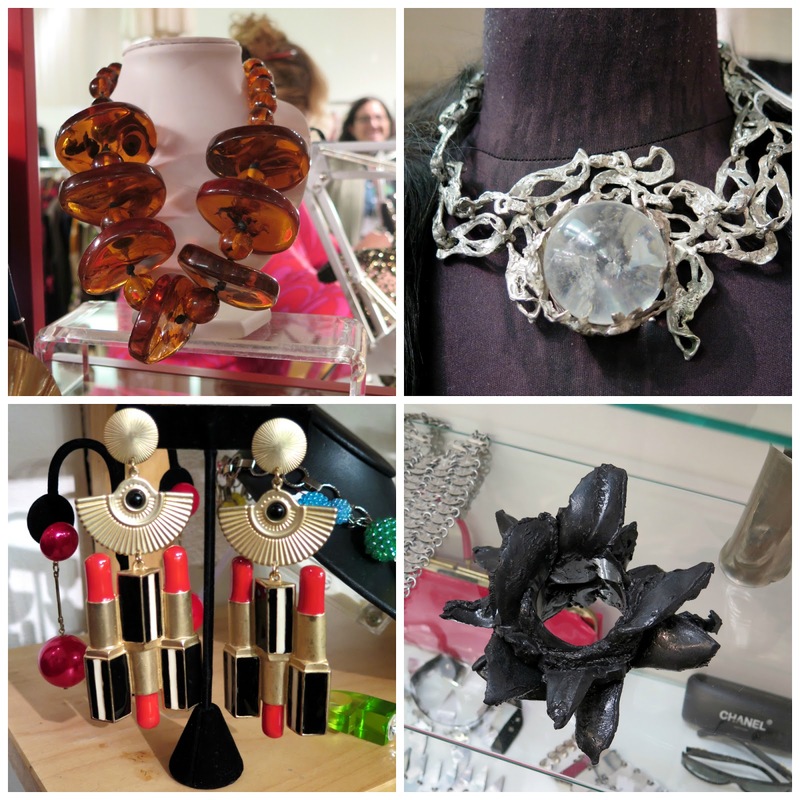 There were some fun pieces of 80's jewellery, glittery 70's platform boots and some drool-worthy pieces of rock and roll history. 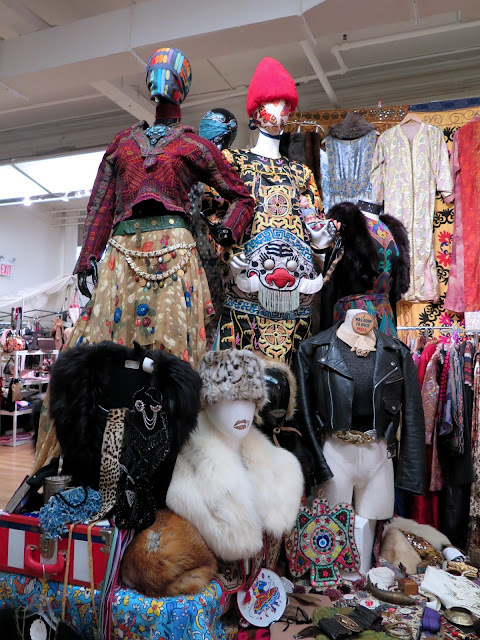 Gypsy Nation Vintage always has one of the most interesting displays in the show, incorporating colourful ethnic clothing and accessories. 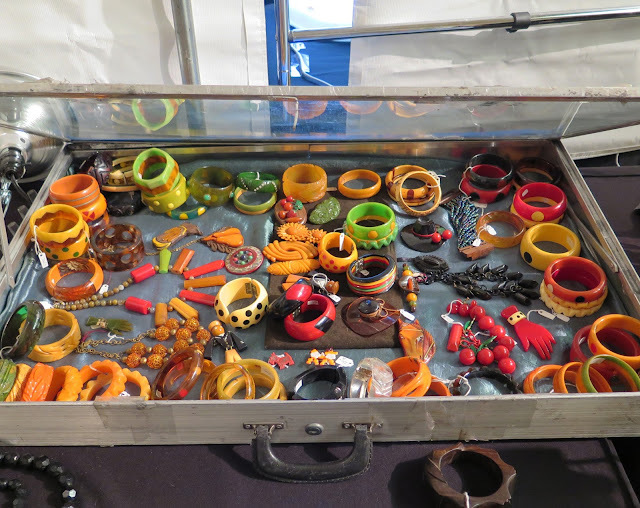 Fool's Gold had a stellar selection of bakelite jewellery. My friend Jean, half of the Idiosyncratic Fashionistas, has an enviable collection of bakelite and is never without an armload of bracelets. If I could choose one piece from the tray above, it would be the pin with the red hand wearing the polka dot bracelet. 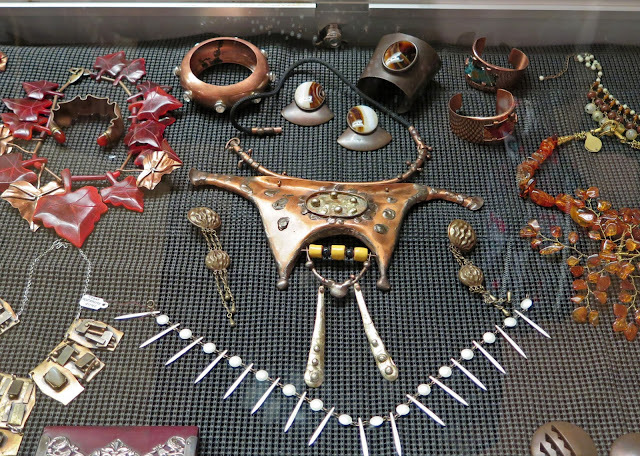 If metal was more your style, Lofty Vintage had some stunning pieces, including the giant tribal-style necklace in the middle of the above display. 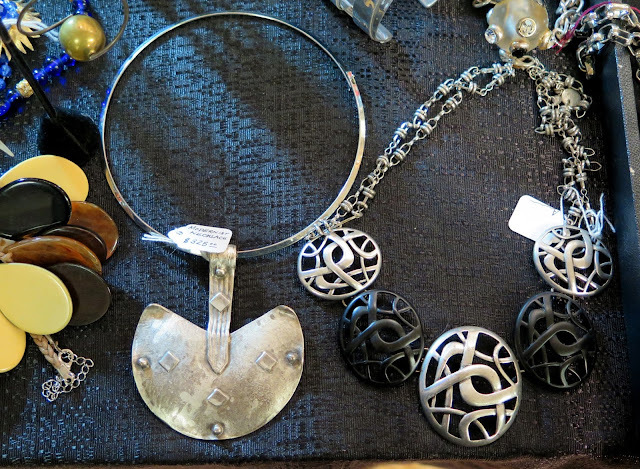 Lulu's Vintage Lovelies had some funky neckpieces like the silver collar above. the place for you. Four of my favourite pieces, clockwise from top left: giant amber chunk necklace from Metropolis Vintage; spectacular silver and crystal choker from Lulu's Vintage Lovelies; an unusual, and rather dangerous-looking bracelet from Vintage Le Monde, and a fabulous pair of "lipstick tube" earrings from Tu Vintage. 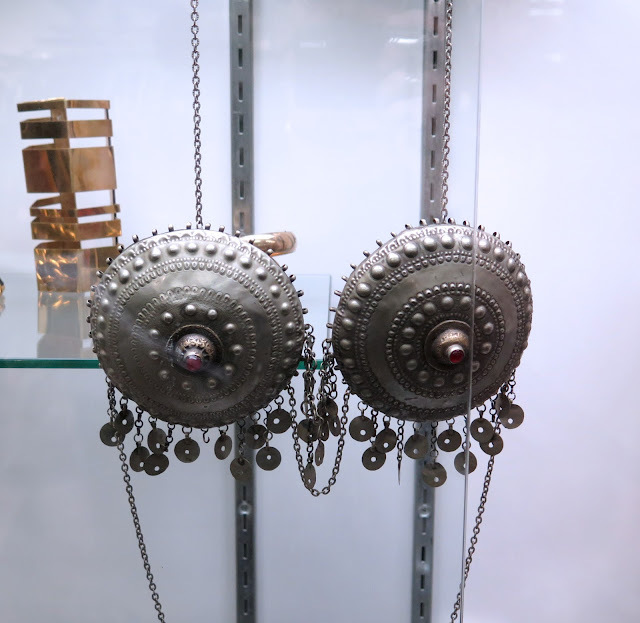 One of most entertaining pieces I found this year was this metal "breast plate" at Vintage Le Monde. I can easily see Vix wearing this with great aplomb! And of course, it wouldn't be a vintage show without hats. I didn't see as many extravagant ones as I have in previous years, but there were definitely some statement-making pieces of headwear available. 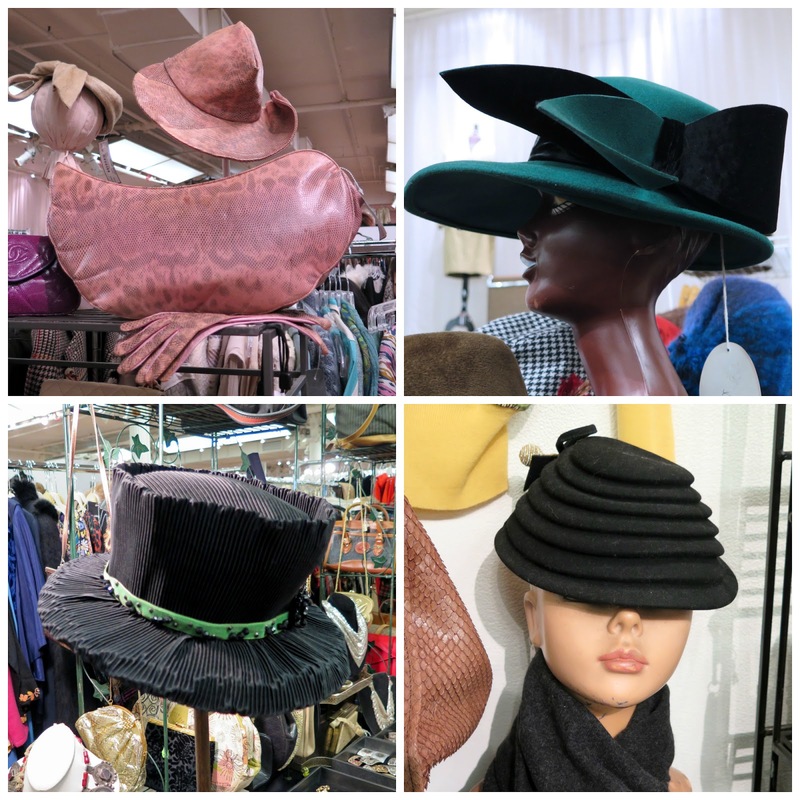 Clockwise from top left: a gorgeous three piece set in pink reptile-print leather from the 1940's at Vintage Martini; a dramatic Jack McConnell design at Lulu's Vintage Lovelies; wool felt spiral hat from Vintage with a Twist, and a silk pleated topper at the Town Peddler. 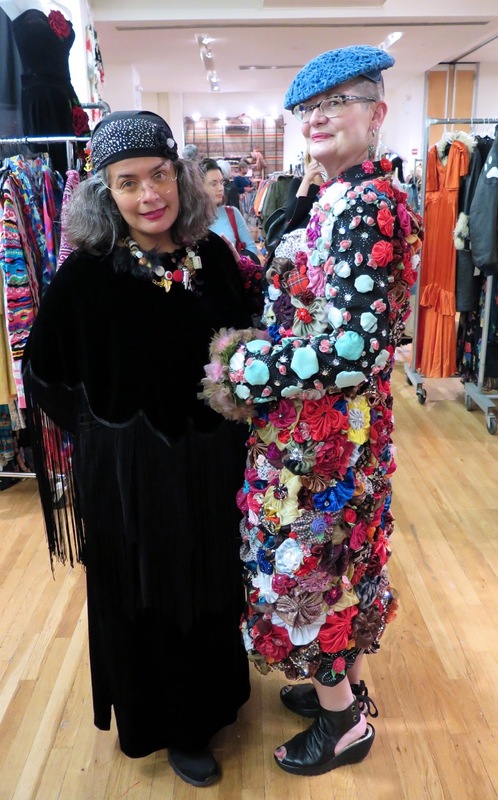 The woman on the left is Carmen Bury, and she made the spectacular coat I'm wearing. I spotted the coat on display and was admiring it, when Carmen introduced herself and explained she had made it, and her friend let her put it on display in his booth, Atellier Montclair, along with some accessories she had made. I couldn't resist asking if I could try it on, and while she said it had never been worn, I was welcome to try it. It weighs about 40 lbs and it took her approximately 6 months to make. We proceeded to take a stroll around the venue so that the coat would get some exposure, and I will readily admit that I felt like a star swanning about in that coat of many colours. Lots of people took photos and it definitely got a lot of attention. Carmen was touched by the compliments people gave her on the coat and thanked me for being her model with a gift of a piece of jewellery she had made. I assured her that the pleasure was all mine. Only in New York! I see a duplicate and a sister of one of my Matisse by Renoir copper cuffs in the case by Lofty Vintage! I am so ENVIOUS of this show - I would love to go to such a high-calibre set of vendors! You showed amazing restraint, Shelley, I would have been shoving money at them. Wonderful trip through this fabulous outing. Thank you! My goodness, how can it be that we went to the same show? You saw so much that I never saw! Particularly love the jacket with the leather peplum, the sweater with arms around the back, and the chunky black neck piece. Could it be that they were sold before I got there? I never thought of myself as having a thing for coats, but now that you mention it, I have more than I should. My guess is they're simply more affordable than dresses, and so less resistible. 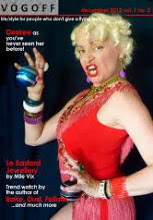 Hmmm.... And the bakelite hand with bangle is definitely FAB! Thanks for the show and tell! You know me so well! That metal breastplate should be in my collection, it's fabulous! I don't know whether I could bear to visit that show, I'd want everything and leave frustrated as I've a feeling everything would be out of my price range. 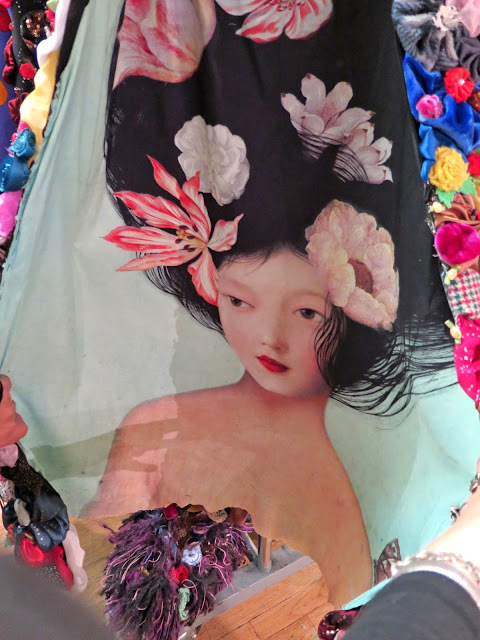 overload of fabulousness!, I'm enthusiastic about so many pieces, all the colors, textures, prints, massive bijouterie and all the things I love!! 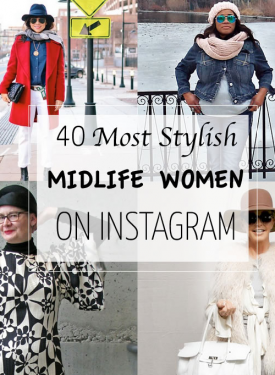 Love those green jackets, love that embroidered coat, and ducks coat too!. Vivienne Westwood and Gipsy Nation vintage, wouuu!! And obviously, You're a Star because you rock that amazing coat with lots of attitude and style!, such a work of art! What fun! That coat is spectacular! Your hat went with it perfectly. I would be SO tempted by everything at that show! Your restraint is beyond impressive. I would have bought that pin you liked so much. It is just so unique. Suzanne... that green long dress the girl is wearing.... so you. My goodness, I feel so happy seeing all these unique and bold pieces. Colour everywhere you look. My favourite is the coat you modeled around the venue. Yes, the inside also begs a display of its own. Absolutely stunning. The designer pieces are spectacular but I suspect that there are as many if not more one-offs by people who are not big names that stand their own or excel beside them. I think I could get lost in that show. 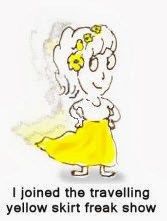 Your idea to time your trip to the show is clever indeed. You do the BEST reporting! Love all the photos and commentary, which is second best to actually attending the show. Brava! And you in the coat! Marvelous! This looks like a spectacular event. Thank you for showing all these amazing photos, it was the next best thing to being there. Wonderful! I would have loved to be with you at this show. My goodness, what a treasures. 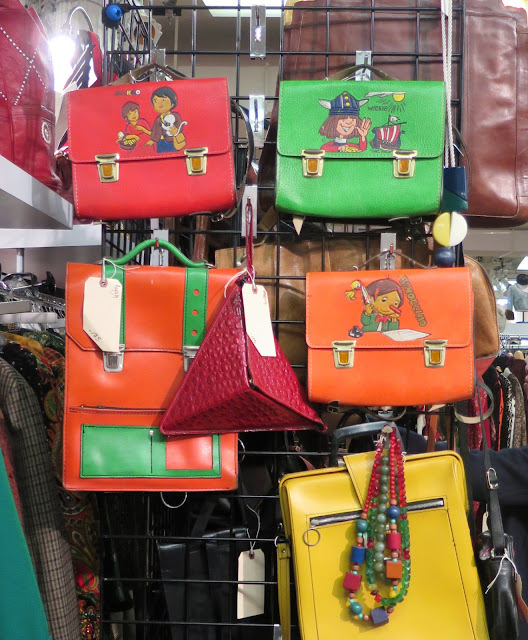 I am not a thriftshop kinda girl, but if we were to have such treasures as you over there, I would be. There are many, many things I would have bought. Thank you for showing all these beauties. 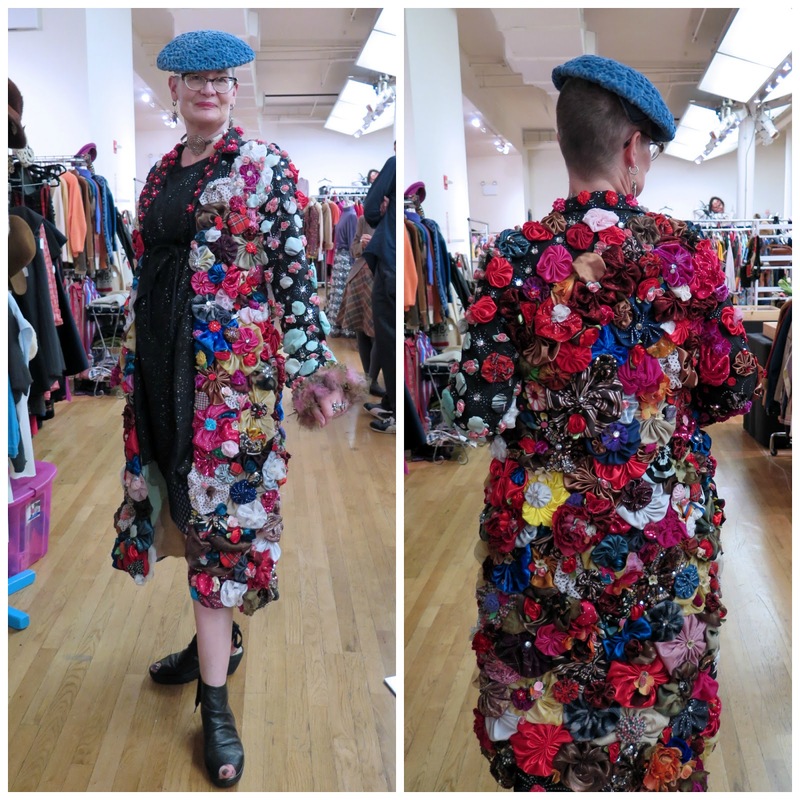 For one thing I would have bought the mohair coat, modeled by Mary Ann. And the acid green fur coat. And perhaps even a hat. I presume you didn't buy the coat you are modelling? I bet it was expensive. Shelley, this post is food for the style-starved soul. So delicious in every way. You look amazing in the coat and the designer is so beautiful in her ensemble as well. So many lovely people and things, so much creativity and joy. As part of the diaspora, I'm breathing it all in. THANK YOU.